After a decade of near-faceless (and guitar-less) superstardom, Depeche Mode strives to get personal with the new Songs of Faith and Devotion. Depeche Mode don’t get any respect. Just ask lead singer David Gahan — that is, if you can single him out of the quartet’s lineup. To this day, he is approached by purportedly devout vans who mistake him for the group’s songwriter and ever-so-infrequently contributing vocalist, Martin Gore. Gahan recently traded sanitary synth-pop couture for biker chic — shoulder-length black hair, an emaciated frame embroidered with tattoos — a change than should help distinguish him from his impish, goldilocked compatriot. Or ask Gore, who says people concentrate too much on Depeche Mode’s synth-pop instrumentation and not enough on its songs. Sure, he appreciates all the recent revisionist critical attention lavished on the band. After a decade-plus of guitar-less devotion to the hi-tech trinity — synthesizer, sequencer, sampler — the group’s 11-album and innumerable-single/remix catalog is being revisited in light of the pop-cultural explosion of rave, techno, and other machine-fueled dance musics. He is likewise thankful that Depeche Mode is no longer pigeonholed with Spandau Ballet, OMD, and other MIA British “new romantic”bands of the early 1980s. But all things said, the songwriter would rather be remembered as a songwriter — and not be credited with “the demise of the song,”which is how he sums up the result of rave’s jubilant fetishization of mindlessness, fad, and surface pleasure. Or ask fourth and final Depeche member Andrew Fletcher. Long since having relinquished any musical input, he oversees the group’s business operations (the band is entirely self-managed). In the group’s collective cockney, Fletcher (or “Fletch,”as the others call him) can readily quote market research, publicity strategies, and sales figures, both past and projected. “In essence, we’re a packet of cornflakes,”Fletcher states flatly in a small pub across the street from Olympic Studios, where Wilder is finishing remixes on the new album’s second single (“Walking in My Shoes”) and Gore is absorbed by a televised soccer match. (Gahan spends much of his time with his second wife, an American, in Los Angeles, where he was interviewed a week after the other three quarters of his band convened in Barnes; each was interviewed separately). “We’re a product,”says Fletcher, “and we appeal to a certain type of person. But we try not to let that bother us at all. We just really try and concentrate on making a good record.”Yet for all his detailed knowledge of audience demographics, Fletcher still can’t comprehend how Depeche Mode acquired its gloom-merchant reputation. “Obviously, compared to Kylie Minogue, we are doomy,”he concedes. The mistaken identities, unflattering idolatry from this year’s pop models, and a reputation for mechanical, sullen music certainly have not hurt the band. 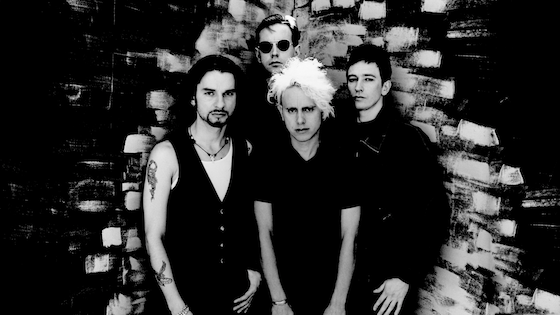 In support of its last album, 1990’s Violator, Depeche Mode toured to 1.2 million faces, the last 75,000 of whom attended a single concert at the Rose Bowl in Pasadena, California. An album-signing appearance at a Wherehouse record store in Los Angeles required more than 130 police officers to disperse at least 10,000 fans. Of course, Southern California has always been a Depeche stronghold (“We were long considered a West Coast act in America,”says Fletcher of the early days. “Not bad for a group from Basildon”), but multi-platinum album sales have established the band’s global stature. Even pop culture’s intelligentsia have caught the bug. Producer Brian Eno, whose 1992 Nerve Net album shows him to be more comfortable than Gore with the “Godfather of Rave”title, contributed two resoundingly ambient remixes of the otherwise pile-driving “I Feel You,”the first single off the new album. And last year, film director Wim Wenders (Paris, Texas; Wings of Desire), who has worked previously with Depeche Mode’s fellow Mute Records compatriots Nick Cave and Blixa Bargeld, struggled for months to tempt the band from a year’s sabbatical to contribute a song to his movie Until the End of the World. He received “Death’s Door,”one of the band’s best, a Kurt Weill”“ish dirge whose bluesy flavor and acoustic sensibility heralded the band’s new direction on Songs of Faith and Devotion, with its hallmark gospel, blues, and swaggering guitars. A so-called “quiet period”followed the highly successful debut, when the three remaining members, Gahan, Gore, and Fletcher, issued A Broken Frame. But 1983’s Construction Time Again announced the arrivals of Alan Wilder and freelance sample-innovator Gareth Jones, who later worked with industrial heavy Einstürzende Neubauten. Recalls Gahan (pronounced “Gone”), “We were experimenting with sampling for the first time. We were going out on the streets, kicking things, smashing things, and getting really into it.”The album marked the sonic inventiveness that would both buttress later weak efforts, such as 1986’s Black Celebration, and push Gore’s best compositions (“People Are People,”“Master & Servant,”“Clean”) over the top. Wilder flirted with songwriting, but soon retired to the shadows of the studio, leaving those instincts to his solo projects, under the name Recoil. Three singles packages targeted the band’s growing audience around the time of the Some Great Reward studio album (1984). 1987’s Music for the Masses showed the band changing orientation, from scattered singles to coherent albums. 1989 brought Depeche Mode 101, an unusually frank tour film documentary, directed by D.A. Pennebaker of Monterey Pop fame, and 101, a live double-album. Violator arrived exactly a decade after the band signed with its English label, Mute, and for the first time introduced a guitar into the mix, with the lead single, “Personal Jesus,”the band’s hardest-driving song yet. “People still miss that,”says Gore. “The main point of that song is the guitar riff. People still consider us an electronic band. And it was followed by ”˜Enjoy the Silence.’ The main riff on that, again, was guitar. Half of that song was guitar,”he trails off, somewhat incredulous. Well, you can’t miss the guitar on Songs of Faith and Devotion. “Walking in My Shoes”sets a Johnny Marr nod over a hip-hop beat. “Mercy in You”rocks Ã la U2’s “Bullet the Blue Sky,”no doubt thanks to Flood, who assisted on the Irish band’s Achtung Baby sessions (his album-production credits include Nick Cave and Nine Inch Nails). And the bottleneck-riddled “I Feel You”one-ups “Personal Jesus.”From the opening tire screech through the rousing chorus of closer “Higher Love,”the album is permeated with Martin Gore’s aggressive six-string. Fletcher’s non-musicality remains the second oddest facet of Depeche Mode, the first being the fact that Martin Gore rarely sings his own songs (just twice on the new album: “One Caress,”backed by a large string ensemble, and “Judas,”with Middle Eastern echoes of Peter Gabriel’s Last Temptation of Christ score). Gahan sings everything else, having written not a single syllable of what are often highly personal lyrics. Yes, the arrangement is only unusual in pop music since the rise of the singer-songwriter. And even then there are precedents, like the Who’s Pete Townshend and Roger Daltry, and Rush’s Neil Peart and Geddy Lee. But with Depeche Mode, the situation is compounded by Gore’s single-minded thematic agenda and deeply emotional content. “It is weird,”admits Gahan. “It’s really strange. I suppose, when I sing his songs, I feel they’re mine. I really get into the words. Martin writes from experience, especially his experience with the band. And because we spend a lot of time together, you’ll experience it as well. So lots of times I feel really close, actually, to Martin’s lyrics, and especially the last two albums, this one and Violator. In yet another facet of the deeply human nature of Songs of Faith and Devotion, Wilder has discovered that there’s no greater fountain of sample-able material than the human voice. “If you think about it,”he says, “the degree of possibilities from the human voice is so great, and just a slight change of mouth movement can create a different sound. It offers you so much more control. I suppose the voice is one generation closer to generating a sound: you don’t have to go through your body to another instrument. One of the great potentials of pop music, and pop culture in general, is that it speaks directly to the masses. For decades, errant professorial types and media-lab researchers have produced volumes of computer music and seen little acknowledgement by the population at large. Bands like Depeche Mode and New Order, however, have ridden the subtle suggestion of the computer-as-musical-instrument straight into the mass mind, aloft on a series of catchy tunes. The above article is a slightly edited version of the piece that appeared in the May 1993 issue of the magazine Pulse!